Coal CEO Robert Murray warns that if the Senate version of tax reform is enacted by President Trump he'll be destroying thousands of coal mining jobs in the process. "We won't have enough cash flow to exist. It wipes us out," Murray told CNNMoney in an interview on Tuesday. Murray, a fierce supporter of Trump's efforts to revive coal, condemned the Senate bill as a "mockery" that would inflict a devastating tax hike on beleaguered coal mining firms as well as other capital-intensive companies. 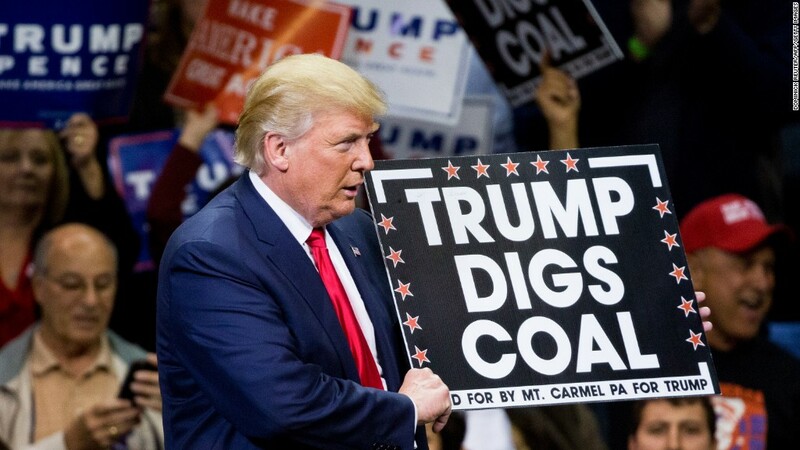 "This wipes out everything that President Trump has done for coal," said Murray, the CEO of Murray Energy, one of America's largest coal companies. The tax bill the Senate passed last week would help companies by lowering the corporate tax rate, but it also eliminates some tax breaks. For coal companies, it could be a double-whammy. It would preserve the Alternative Minimum Tax (AMT) and impose new limits on the interest payments that businesses can write off. Murray Energy estimates that these changes would raise its tax bill by $60 million per year. The House bill eliminates the AMT, something that would save Murray Energy and other companies money. The AMT prevents companies from claiming so many tax credits and deductions that they owe Uncle Sam nothing at all. Like other coal companies, Murray Energy borrows heavily to pay for its expensive mining operations. The Senate bill would cap the amount of interest payments that can be written off to 30% of a company's income. Auto dealers would also have been harmed by the Senate bill's interest deduction cap. But, after fierce lobbying from auto dealers, the Senate made a last-minute change to the legislation that exempts them from the interest deduction cap. Murray declined to say if he shared his concerns with Trump, who has promised to "put our coal miners back to work" by reducing environmental regulations. Trump attended a West Virginia fundraiser hosted by Murray in June 2016. "I know he cares about the coal miners and their jobs," Murray said. Murray warned that a bankruptcy of his Ohio-based company would hurt its 5,500 employees along with their families. Asked if other coal mining companies could go out of business, he said: "Most certainly." Roughly half of American coal jobs have disappeared since the end of 2011 amid a wave of coal bankruptcies, according to a Columbia University study. The research found that coal's decline has been mostly caused by an abundance of cheap natural gas that has led power plants to switch away from coal. Regulation, which Trump commonly blames for coal's troubles, also hurt coal but not by as much as natural gas. More recently, the coal industry has been pressured by declining costs for renewable energy like solar and wind. Murray's comments about the tax overhaul are not the first time he's made dire predictions about his own business. In August, Murray warned that his company could immediately go bankrupt if the Trump administration didn't issue an emergency order protecting coal-fired power plants from being closed. "Our time is running out. Please fight for us," Murray wrote in a letter to the White House. The Trump administration ultimately rejected the cry for help, deciding there wasn't enough evidence to "warrant the use of this emergency authority." Murray told CNNMoney that his company now believes it can survive by ramping up exports. That could shield Murray Energy from the shutdown of more U.S. power plants that it supplies. "We believe we can get through it," he said. Murray is known for fiercely defending the coal industry. In June, he filed a defamation lawsuit against comedian John Oliver, HBO and CNN owner Time Warner (TWX), alleging "character assassination" during an episode of "Last Week Tonight." HBO has filed a motion to dismiss the lawsuit. A hearing on the motion is scheduled for January 10 in West Virginia, according to an HBO spokesman. The coal boss has also enraged environmentalists by repeatedly denying the risks posed by climate change, a stance he repeated on Tuesday. "Climate change is not only a hoax, it's a fraud," Murray said. --CNNMoney's Lydia DePillis and Chris Isidore contributed to this report.